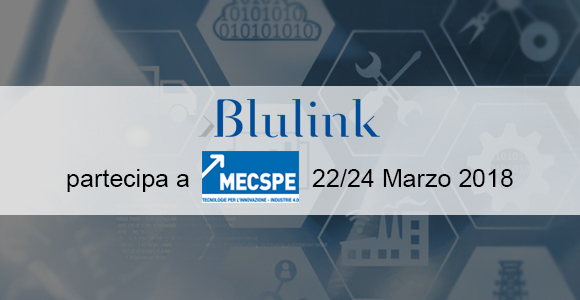 Blulink will be present at MECSPE 2018 – scheduled from March 22nd to 24th at the Fiere di Parma – together with the partner Tesar. Come and visit us at stand B37 (PAD 4.1) we will tell you in detail all the new features in Quarta®3, the Blulink’s solution for Quality and Safety Management which can create real value for the company. MECSPE will show to visitors a complete overview of the production and industrial chain, which allows each visitor to discover all the news from the market thanks to 12 thematic halls, squares of excellence and neighborhoods, which allow a better orientation for those who participate, and with a 360° overview of materials, innovative products and technologies for every sector of the manufacturing industry. Request your free entry ticket to the fair and come to visit us!